Escápese a la bulliciosa Ubud y las playas del sur de Bali para realizar una excursión de 2 días por el centro y el norte de Bali. Vea un espectáculo de danza cultural en ruta a las aldeas de Celuk y Mas, el templo de la primavera sagrada de Tirta Empul y el volcán de Mt Batur. Pasar la noche en un balneario en Lovina, famoso por sus playas de arena negra. Luego dirígete a los lagos de Bedugul y al pueblo de montaña de Munduk. 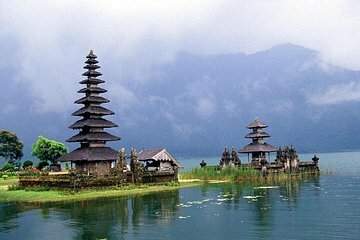 Vea su cascada de la selva y visite varios templos: Ulun Danu Batur, Taman Ayun y Tanah Lot, con una guía informativa. Ver un espectáculo de danza barong y kris. Visita a los pueblos artesanos de Celuk y Mas. Recogida y regreso al aeropuerto o en hoteles ubicados en el centro de Ubud o Denpasar. Transporte en vehículo con aire acondicionado incluido. This trip was un-reviewed on Viator. We took the risk of booking it only because of our faith in Viator. Bad decision! The tour operator - Asian Trails, was extremely unfriendly and unaccommodating. We were to be picked up on 13th Sept at 8:30 a.m from Holiday Inn Resort Bali Benoa and our first stop would have been the Barong dance. But it started to rain heavily at around 8 a.m. We were ready for check-out at 8:30 and had informed the front-desk to inform us as soon as the tour guide arrived. Once he arrived, we asked him if there was any point in proceeding with the trip if the rain continued. He clearly said that the rain would not allow us to see everything. Upon hearing this, we asked him to request the tour company to shift the trip to the next day. They took 40 minutes to get back, refusing and saying that their hotel partner - Aneka Lovina, would not allow a change. That was understandable, but what was completely unfair was that they said that they - Asian Trails, would charge us 50 of the fees if we shifted our dates! So, we were forced to undertake the trip, knowing fully well that there was a high chance that all our money would go waste since we would not get to see anything. By the time all this ruckus was laid to rest, it was 9:30 when we left. This they later on held against us, saying we missed the Barong dance because WE left late. The rain subsided by about 11-11:30. The guide - Raditya- informed us that the Barong dance happens in the open, and only at 9:30,which may will have to be skipped from the itinerary. We were very dejected, because for us that was the highlight of the trip. The stay at Aneka Lovina was lousy. So was our guide, who was sweet but not very forthcoming with information. The tour was very 'rushed', apparently to go 'strictly as per itinerary'. In that case if something got missed because of weather, the company should have arranged for it the next day.Also,we had different itineraries between the guide and us!